Net café refugees (ネットカフェ難民, netto kafe nanmin), also known as cyber-homeless (サイバーホームレス, saibā hōmuresu), are a class of homeless people in Japan who do not own or rent a residence (thus having no permanent address) and sleep in 24-hour Internet cafés or manga cafés. Although such cafés originally provided only Internet services, some have expanded their services to include food, drink, and showers. They are often used by commuters who miss the last train; however, the net café refugee trend has seen large numbers of people use them as their homes. A Japanese government study estimated that over 5,400 people are spending at least half of their week staying in net cafés. It has been alleged that this phenomenon is part of an increasing wealth gap in Japan, which has historically boasted of having a very economically equal society. According to the Japanese government survey, those staying have little interest in manga or the Internet, and are instead using the place because of the low price relative to any of the competition for temporary housing, business hotels, capsule hotels, hostels, or any other option besides sleeping on the street. It was also estimated that about half of those staying have no job, while the other half work in low-paid temporary jobs, which paid around 100,000 yen ($1000) per month – lower than what is needed to rent an apartment and pay for transportation in a city like Tokyo. Some internet cafés offer free showers and sell underwear and other personal items, enabling net café refugees to use the internet cafés like a hotel or hostel. Another word for Net café refugees is cyber-homeless, a Japanese word based on English. Typically, the cyber-homeless are unemployed or underemployed and cannot afford to rent even the cheapest apartment, which is more than the cost per month to rent an internet booth daily. The cyber-homeless may even use the address of the internet café on resumes when applying for jobs to conceal their present form of accommodation. 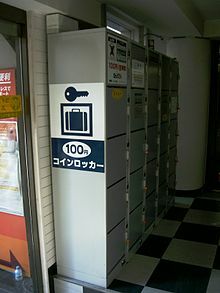 The fee of around ¥1400 to ¥2400 yen for a night – which may include free soft drinks, TV, comics and internet access – is less than for capsule hotels. Some cyber-homeless may also be freeters. Internet cafés in Dublin, Ireland are also known to allow homeless people to sleep in chairs or on desks overnight, typically charging €6–10. ^ Justin McCurry (28 September 2007). "Tokyo dreaming". Guardian. Retrieved 15 January 2017. ^ BusinessWeek. Japan's Net Café Refugees. August 28, 2007. ^ Water Week. New Japanese underclass, “net cafe refugees”, emerges: homeless and low-paid, living in cubicles, and net lounges. 17 October 2007. ^ a b Paul, Kari (18 March 2015). 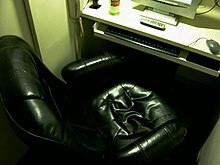 "The Japanese Workers Who Live in Internet Cafes". Motherboard. ^ "Cyber cafes a homeless haven". Television New Zealand. Reuters. 7 May 2007. Retrieved 30 October 2011. ^ "21% rise in numbers sleeping rough in Dublin". 21 November 2014. ^ "Internet cafes prove an unlikely refuge for city's homeless". ^ "Internet café 'exploiting' homeless by charging €10 a night to sleep on chairs and floors – Independent.ie".